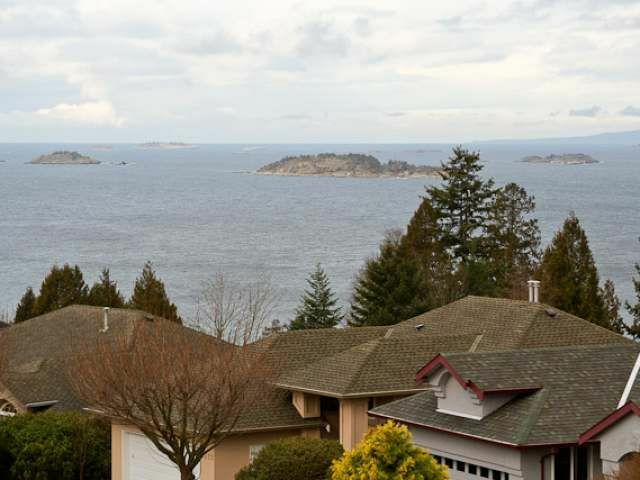 This stunning home, with world class ocean views is located in one of Nanaimo's premier neighbourhoods. The panoramic ocean views of the Georgia Strait, Winchelsea Islands and Coastal Mountains are absolutely unparalleled, especially at sunset. This dramatic home offers over 4500 sq feet of finely finished space, designed and built for the most discerning home owner. Entering the home, you will discover an impressive marble foyer with a curved staircase leading to the main floor. This home is comprised of 3 levels, 5 bedrooms, 5 bathrooms, expansive formal and informal areas, family sized kitchen, sauna, 6 gas fireplaces and an open plan that captures ocean views from every angle possible. The principal bedroom is located on the main floor and is truly magnificent, complete with large double shower, separate Jacuzzi tub and private washroom area. The garage is over sized, in height and length, measuring 34 feet long and may be able to fit 3 cars. There are not many homes of this magnitude being offered for sale and priced well below the assessed value. Due to the sheer size of this home we suggest you take full advantage of the virtual tour and view the floor plans online. Call Marilynn Kennedy or Jason Blanchette to arrange your private viewing.